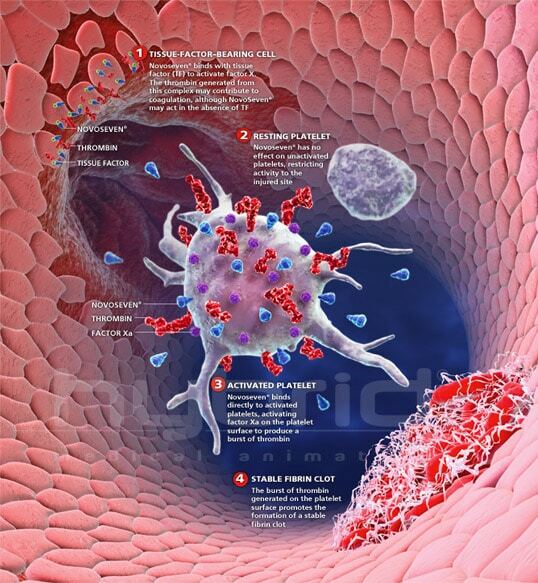 Large-scale illustration created for Novo Nordisk Pharmaceuticals as part of an in-depth focus on the innovation of NovoSeven® and the NovoSeven® Mechanism of Action. Using one main visual, portray the 3 overlapping phases involved in the cell-based model of hemostasis and the formation of a stable fibrin clot. The scene setting and characters involved in the illustration were developed in such a way that would allow for their easy integration into a 5 ½ minute MOA animation centered on the evolving model of hemostasis and the NovoSeven® mechanism of action. A sequence from the MOA animation can be viewed from the link below.